I’ve long been using apple cider vinegar to make pesto and to pickle vegetables. Surprisingly my recipe for beetroot pickled in apple cider vinegar is the second most visited Feast Wisely post. So whats the deal with this special vinegar? It has a reputation as a superfood and is often touted as a digestion aid when taken before a meal or upon waking. What’s less well known is that apple cider vinegar can clarify and clear the skin. I came across this use recently when looking for a natural remedy for a stubborn bit of irritated skin on my face. Mixed with equal parts water apple cider vinegar makes for a natural (and cheap) skin toner. Armed with an old spray bottle, I prepared a batch a few weeks ago and have been applying it as a daily toner since. Of course as well as being a potential food for your face apple cider vinegar has conventional uses. One of which is as a substitute for other vinegars in sauces, relishes and pickles. 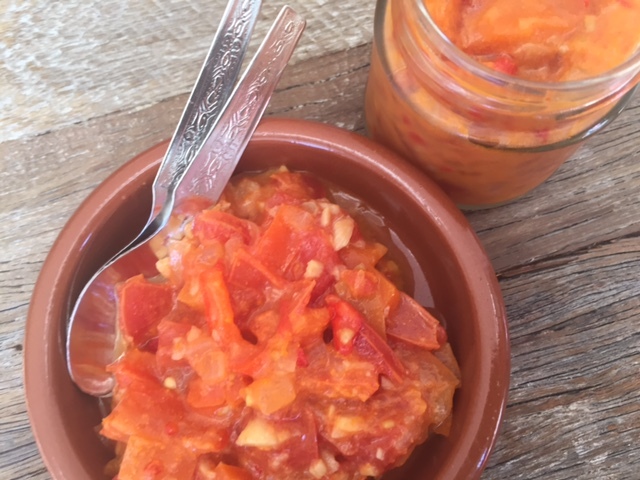 The recipe I’m sharing here for spicy tomato relish came from Australian chef Neil Perry. As you’ll see he uses a generous dose of apple cider vinegar. When choosing apple cider vinegar bear in mind that not all bottles are equal – the typical supermarket brands have been through a filtration process that removes some of the goodness. The ‘cloudy’ versions are the best. I buy a brand called Bragg – its organic, raw and unfiltered and available in most health food stores. Finely chop the onion, ginger and garlic. Dice the capsicum into small even pieces. Heat the oil in a pan and add the chopped ingredients – cook over a low heat and stir regularly. In the meantime roughly chop the tomatoes, removing the core if you prefer. Once the onion is soft add all of the remaining ingredients to the pan and bring to a simmer. Cook uncovered for around 1 hour or until the consistency is relish like. Note – Neil Perry blanches the tomatoes in boiling water, dips them in ice water and then removes the skin. But given the high fibre in the skin (and the extra hassle this entails) I opted against doing this. Do you have any clever uses for apple cider vinegar? If so I’d love to hear more….. Tags: chilli, recipe, relish, sauce, tomato. Bookmark the permalink. Yes Elaine I’ve started to do the same – well perhaps only with the exception of balsamic! 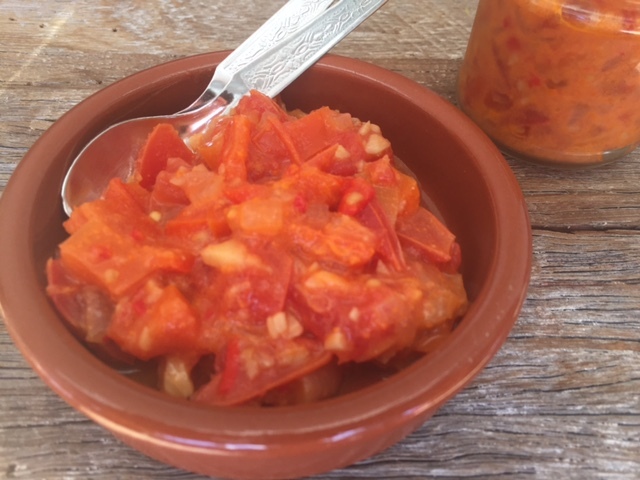 This recipe for relish has my mouthwatering! I love a good pickled, mouth-puckering condiment! Thanks Amy – and hope you enjoyed your break from posting…. 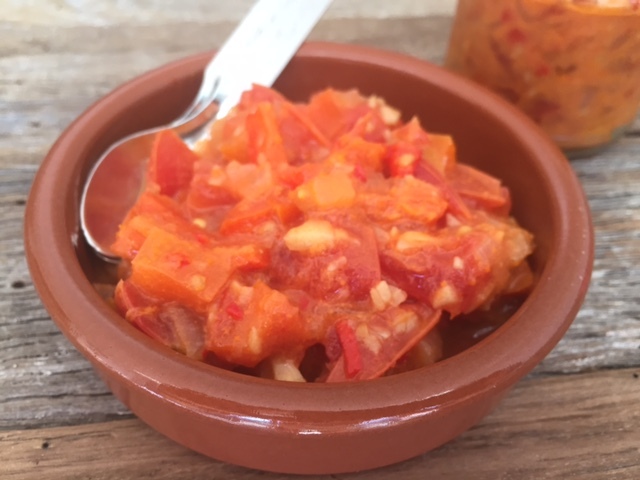 Your tomato relish sounds like a great side to accompany many dishes. I’m going to have to look for the unfiltered cider vinegar. Thanks Karen – the vinegar is available in most health food stores….